Today's IT operational teams face unique challenges associated with the day-to-day management of systems across colocation facilities, cloud/hybrid environments, and owner-operated data centers worldwide. The devices in these modern data center environments—everything from intelligent rack PDUs to environmental sensors to door locks—are generating massive amounts of data. Data center managers are struggling to rise above the noise and identify the data that is most relevant to them. With so much data, how can you be sure that you’re using it effectively to make smarter decisions and better manage your data center? Why data center operations is a big data problem. During this session, James Cerwinski, Director of Product Management and Marketing at Sunbird, will explore how DCIM enables you to obtain and act on the data you need to tackle your daily challenges at the speed of business. James has been working in the DCIM business since 2008 and has designed mission-critical management systems for over 20 years. 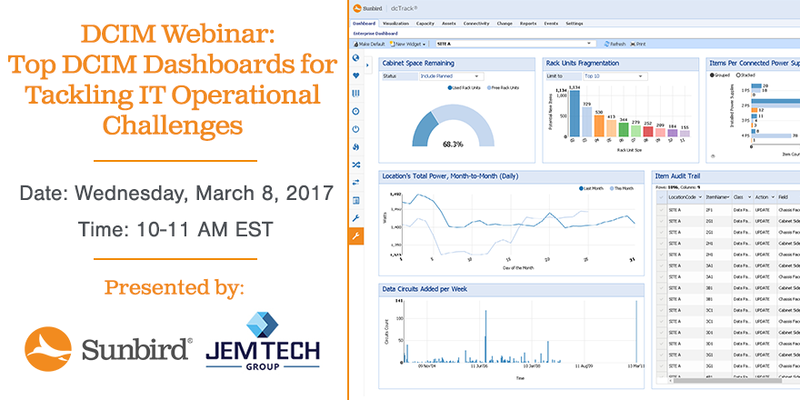 You won’t want to miss out on this webinar. Register now to reserve your spot.